The new Comic Scene UK is a full colour A4 monthly magazine with all the latest news and articles on classic comics, reprinted material, new titles and comic creators. 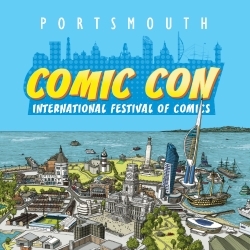 Published by ComicsFlix.org it will be a showcase for fans including the best in Cosplay, UK fandom and stripzines now and from the last 50 years. The magazine is available by mail order only and you can subscribe in advance now. A limited print run ‘ComicScene UK’ will give a percentage of the profits from the title to provide free kids comic workshops across the U.K. If you take out a subscription for 6 or 12 issues we will get a donation too. Judge Dredd v Batman, Strontium Dog, DR and Quinch, Free Comic Day, 80 years of the Beano, The Prisoner and Superman, Six Million Dollar Man v Mach One, Charley’s War, Bella at the Bar, Slaine, Halo Jones, Rok of the Reds, 50 years of fandom and comic con, 40 years of Starlord, 40 years of Misty, 30 years of Tank Girl and Deadline, 30 years of Hellblazer, 20 years of the comic blog Down The Tubes, the new Doctor Who Jodie Whittaker, the Return of Roy of the Rovers plus all the latest news and gossip from the comic, small press, cosplay and related media industry from some of the best writers in the business. You can get ComicScene UK for a 12 month subscription of £93.50 and you will get issue 1 for FREE – 12 issues for the price of 11! If you take out a subscription for 6 or 12 issues we will get a donation too!